More than 500 adivasis, farmers, workers and activists from various mass organizations and movements representing about 25 districts of Madhya Pradesh came together in Bhopal to represent before a panel of experts on the “ongoing corporate loot and diversion of natural resources” as part of the national campaign begun by the Bhumi Adhikar Andolan (BAA), a new apex body formed to raise grassroots level issues across India. 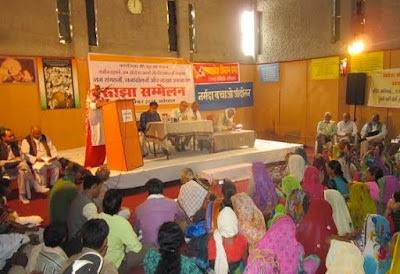 During the hearing, which took place on November 24, people spoke of “unjust” acquisition of land, multiple displacement and denial of rehabilitation through various projects and interventions of the state government, especially during the so-called ‘golden rule’ of Shivraj Singh Chauhan, over the past decade. The meeting, which took place at Gandhi Bhavan, was preceded by a rally. Those who participated during the hearing included Badwani, Khargone, Dhar, Neemuch, Gwalior, Vidisha, Sidhi, Singrauli, Bhopal, Satna, Anuppur, Shahdol, Alirajpur, Rewa, Mandla, Jabalpur, Katni, Panna, Umariya, Bhind, and Morena. Panel of five eminent citizens which heard the representations included Arun Gurtu, Former Director General of Police, Madhya Pradesh; Rajesh Joshi, Hindi writer, poet, journalist and playwright, who returned his 2002 Sahitya Academy Award recently; Prof Suresh Mishra, former professor of history, Bhopal, and chief patron, Global History and Culture Review Project, Central Indian Historical Research Foundation; and others. “The panel heard more than 50 depositions for over five hours from various people affected by large dams, thermal power plants, nuclear plant, canals, reservoirs, national parks, sanctuaries, highways, private and public sector companies”, the statement said. “The panel concluded that there was gross violation of the laws and directions of the Supreme Court and the High Court, non-consultation with the Gram Sabhas as per PESA Act, 1996, prioritization of corporate interest over the common citizenry, shoddy rehabilitation, serious impacts on the environment as well as pauperization of the adivasi, dalit, women, working and farming communities”, it added. During depositions, Navratan Dubey of Mandla talked about the serious impact of the Chutka Nuclear Power Plant; and Shanno Mansuri of District Dhar spoke of the massive displacement of 2.5 lakh people due to the Sardar Sarovar Project, and false claims of rehabilitation and resettlement (R&R) leading to denial of land and poor status of R&R sites. Further, Sunder Singh Baghel, Sidhi pointed towards the multiple displacement for the Ram Sagar Dam, Dudhi Coal Mine, and Sarai Thermal Plant; Sanjay Namdev and Ramlallu Gupta of Singrauli complained against the NTPC, the JP-owned and other Thermal Plants leading to severe health impacts, water and air pollution, soil contamination etc. There were depositions on displacement of 40 villages due to bird and wild life sanctuary near Gwalior, the displacement of farmers due to the Mosaber Company, the struggle of forest dwellers and tribals for pattas and serious impacts of power companies on agriculture and environment, diversion diversion of irrigated land and water from Maan Dam to the Aditya Birla Ultratech Cement Company. The representatives also spoke about the struggle of farmers against forced land acquisition for cement plants and other private companies in Jalasore, displacement without rehabilitation of 162 villages affected by Bargi Dam, displacement in the name of smart cities and beautification, impact on slum-dwellers, hawkers in Indore, Bhopal, Jabalpur and other cities, and so on.